THPRD is seeking public comment on the draft master plan of a new 7.4-acre park site in Aloha at a May 16 meeting. 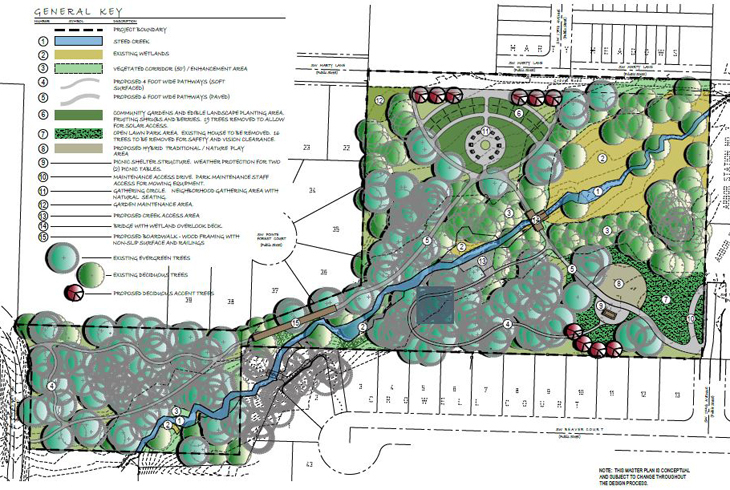 On Tuesday, May 16, the Tualatin Hills Park & Recreation District is holding a public meeting to review the draft master plan for a new 7.4-acre neighborhood park slated to open in Aloha in 2019. This new park is composed of the existing Crowell Woods Natural Area and two parcels purchased for future development. Last October, THPRD began an unprecedented public engagement plan to inform this master plan. We developed a community survey, and hosted community conversations and design workshops to hear directly from park neighbors and other community members about their needs and preferences. We've listened, and we have developed a draft master plan that we believe meets the needs of this diverse neighborhood. Before we take the plan to our Board of Directors for approval, we’re inviting community members to take a closer look at the plan, hear from our planners about the challenges and opportunities this site presented, ask questions and provide comments. Attend the May 16 meeting, which will be held at Beaver Acres Elementary School’s cafeteria from 6:30-8 pm. Note: we will have kid-friendly activities and light refreshments available. Participate in our online open house. Click here to see the site, hear about the public process, review the proposal and provide comment on the draft master plan by 5 pm on Monday, May 22. We’d love to see you (or hear from you)! More information about this project is available at thprd.org. Questions? Contact rrussell@thprd.org.